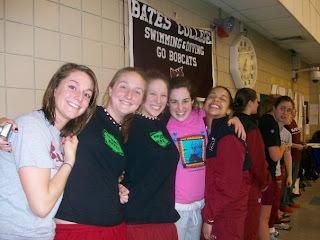 The Bobcat Chronicle: Meet Recap - W NESCAC! Meet Recap - W NESCAC! 1 Diver of the Year Award!1 Diving Coach of the Year Award! 5 Bobcats of the week, a NESCAC swimmer of the week, a Collegeswimming.com National Swimmer of the Week, 11 New School Records, 6 of our athletes performed National Consideration Cuts - one of which automatically qualified! - 2 Relays hit the B-Cut time, 67 Lifetime Bests at our NESCAC Meet, 3 athletes heading off the Nationals, and both a Diver and Diving Coach Of the Year award! Last night I quickly thanked the women's team as we got off the bus by telling them that even though they aren't special, they truly are (nice, huh?). This sport can give you a perfect swim or a perfect dive, but it never gives you a perfect weekend, or a perfect season. There are ups and downs... there are battles left and right... there is always adversity... and there are several moments when each and everyone wonders why they are putting themselves through all of this. Weekends like this help, but honestly, it is simply the person inside who decided to believe in themselves that makes this such an amazing sport. 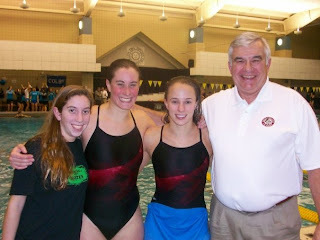 I am a lucky man to work with such amazing divers, swimmers, and coaches. Thank you Seniors for being such great leaders and making this program feel more like a family. Thanks to the Alums that continually contact us and show their support through texts, emails, phone calls, visits, and donations. Thanks to the parents who get together each session and cheer their hearts out. And thank you to Bates for attracting the best student athletes in the country. More to come next weekend when the men try one more time to show up the women! As in the words of the Men's team inspirational icon..."Nuthin' to it, but TO DO IT!" ...Remember SWIM, HAVE FUN,the time WILL COME!